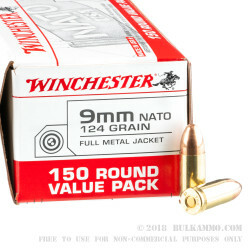 This is a 9mm NATO cartridge made by Winchester. It’s an overpressure variant of the 9mm that you’ll find especially handy if you would like to comply with the Hague Convention of 1899 which bars the use of expanding ammunition in warfare. We do hope that your ammunition will be provided to you free of charge by the government if you are actually engaging in warfare, however. 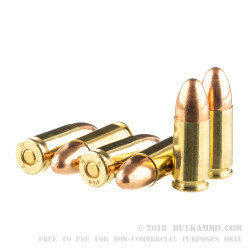 This cartridge features a 124 grain full metal jacket projectile. The bullet may not expand during penetration, but it will prevent your firearm’s bore from rapidly accruing lead residue. It will also promote smooth feeding in a semi-automatic, whether its a handgun or a rifle. 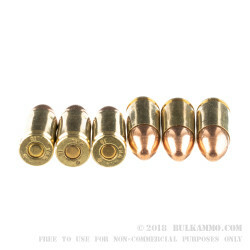 This cartridge further offers a reloadable brass casing. Winchester sealed the round’s primer so that your training session won’t be impacted by water infiltration. 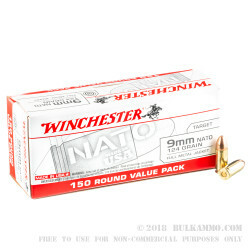 With 150 cartridges in one handy, beefy box, you’ll have the ample fodder it takes to thoroughly sate your appetite for plinking and/or target practice.